It is not just what you throw, but IN what you throw that makes a big difference to our waste situation in India. A lot of urban residents feel that using plastic bags as bin liners is a great way to ‘reuse’ the bags but in effect this is just throwing the plastic bag into the garbage – along with the garbage in it. Whats makes it worse that often bin liners are used to prevent the bin from getting soiled by wet food waste – so using a plastic bag as a bin liner means that we are mixing up two different types of waste – one that is biodegradable (food) and one that is not ( the plastic bag). Use newspaper to line your bin. The challenge with throwing wet waste in newspaper is that the paper absorbs the water and when you are emptying the bin it tends to disintegrate and not hold the waste anymore. One cannot tie it up as one does a plastic bag nor carry it out. 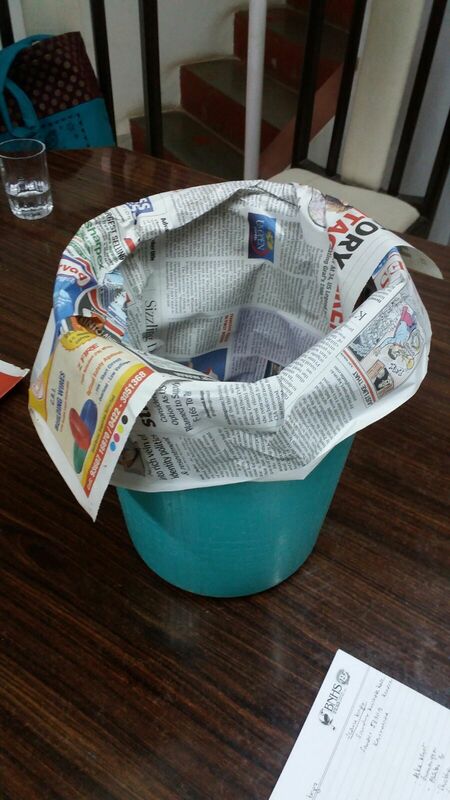 Two enterprising women in Pune, Sonia Deol and Renu Sakhalkar took this problem into their own hands and found a way to make a bin liner by folding the newspaper intelligently. They started doing this at home and slowly have been approaching neighbours and friends to get them into the habit of using these liners. While it is not a bag, the bin liner they make has a sturdy base and also can be folded over the edges of the bin to give almost all the convenience that the plastic bag provides. Newspaper is biodegradable and therefore the benefit of using these paper bin liners is huge – for the environment. If these bin liners enter the compost pit along with the wet waste they will not cause as much damage to the compost as they will degrade along with the food waste. Thin plastic bags pose a serious problem to waste segregation and management. Often stray animals such as dogs cats and cows who are hungry and trying to reach the food waste inside the bag, get choked on the plastic bag and die. Plastic bags that are not taken out of waste heaps, clog drains and cause massive flooding in urban area. While switching to a newspaper bin liner may seem like a small and seemingly insignificant detail, in fact it is the solution to a very large problem. As part of the Beauty of Recycling campaign, eCoexist will be offering free workshops on how to make your own newspaper bin liners to anyone who wishes to learn. We will also be training rag pickers and challenged adults to make these and earn a small sum from selling them.